Here's a rare treat with a Halloween theme - some music composed especially for the spooky season. It's a concert from the "Hollywood Bowl", distributed as Program 78 in the series when it was broadcast on the Armed Forces Radio Service. According to Jim Hiliker of Monterey, California on the OTR mailing list, KFI locally broadcast the Hollywood Bowl concerts in the 30s and 40s, so the show probably originated at KFI. A Mario Lanza website dates this particular show to July 24, 1948. It's "MGM Night", so we hear various musicians and personalities under contract to the studio. The orchestra is conducted by Miklos Rozsa and we hear Mario Lanza, very early in his Hollywood career, and Kathryn Grayson doing the vocal duties. The program opens with the overture to the "Bartered Bride" and we hear works by Puccini and Victor Herbert. The highlight of the show is "The Halloween Suite" composed by none other than actor Lionel Barrymore, who also provides narration for the piece. This "Time" magazine article from 1944, notes that Barrymore had composed hundreds of works in the since the turn of the century, a side of the famous actor not as well known as his work on the screen. 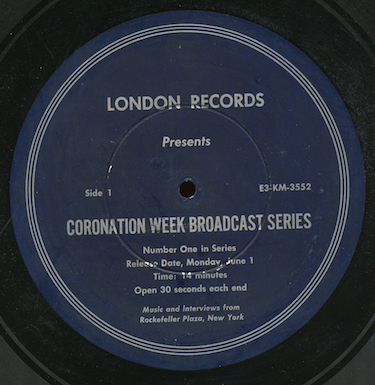 The show was transferred from an original undated AFRS vinyl transcription set and appears to be uncommon or uncirculated among old time radio enthusiasts. updated 11.3.2009: Corrected spelling of "Miklos Rozsa". Here's another one of those original line checks from 1947-48 I keep running into. In this one, the August 28, 1947 edition of the "Kraft Music Hall" featuring Nelson Eddy with Nadine Carter, pianist Leonard Pennario and announcer Ken Carpenter. Nelson kicks off the show with "The Ranger Song", and we hear "Smiling Through", "The Floral Dance" and other tunes. All that great music makes you want to go out and stock up on Kraft Cheese Spreads and Kraft Prepared Mustard, doesn't it? Transferred from an original lacquer line check recorded at an unknown local NBC station. My apologies for the skip I couldn't work around in "I'll See You Again" in the second half of the show. We turn now to one of the great musical variety programs of the OTR era, "Kraft Music Hall". During the show's long run, it featured stars like Al Jolson and Bing Crosby. This program, originally broadcast on NBC July 3, 1947, is headlined by Nelson Eddy and features Met opera star Nadine Conner, announcer Ken Carpenter, and Robert Armbruster and His Orchestra. Eddy kicks off the show with "Listen to the Band" and performs "Beautiful Dreamer" and "The Owl and Bobcat" (from "Naughty Marietta") among other tunes. Of course, we get to enjoy Carpenter's wonderful commercials for Kraft Miracle Whip and Cheese Spreads. Can you pass up the chance to hear Nelson Eddy operatically "meow" in "The Owl and the Bobcat"? The program was transferred from an original lacquer line-check recorded at an unknown NBC affiliate and includes the NBC chimes. It appears to be not in common circulation among old time radio collectors. This week on the blog, we're featuring a couple of Christmas-themed public service programs. Back in the days when radio played a much larger role in the media landscape, charities didn't just send public service announcements to stations to promote their work - they'd send full, slickly produced special entertainment programs featuring top stars that stations could play from transcriptions. First up, a very nicely recorded program of light classical music with the San Francisco Opera Orchestra and many well known opera stars. Lawrence Tibbett reminisces about the first time he sang publicly for a Salvation Army event and Jean Hersholt, radio's "Dr. Christian", makes an appearance. Other performers heard include Set Svanholm, James Wallington, Glenn Wheaton, Licia Albanese, Jussi Bjoerling, Kirsten Flagstad, and Winifred Heidt. 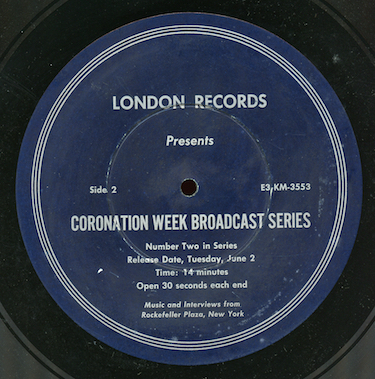 The show was transferred directly from a set of transcriptions pressed by RCA, matrix numbers RR 17174 and RR 17175. Here's the last transcription I'll be posting for now in the series "The Works Progress Administration Presents", a program featuring musical ensembles of the Federal Music Project and information about programs and services of the WPA to help communities with the Depression. In program 46 of the 1938 series, we hear the Commonwealth Symphony and State Chorus of Boston, conducted by A. Buckingham Simpson, performing excerpts of Bizet's "Carmen". The program was transferred directly from an original RCA Victrolac pressing, matrix MS 013478. I have one more program in the series, featuring a Federal Music Project group performing folk music of Mexico, but it's badly pressed and doesn't have the best sound - if someone is interested, I can post it on the blog at a later time.